Examples like Bingson and Stanley aren’t meant to prove that all large people are healthy. Instead, they offer a great reminder that size doesn’t necessarily dictate health. While large individuals are sometimes much more healthy than they look, some slim individuals can be much less healthy than they appear. In the past, I’ve posted articles about fat positivity on Social Media only to be reminded that fat=unhealthy. 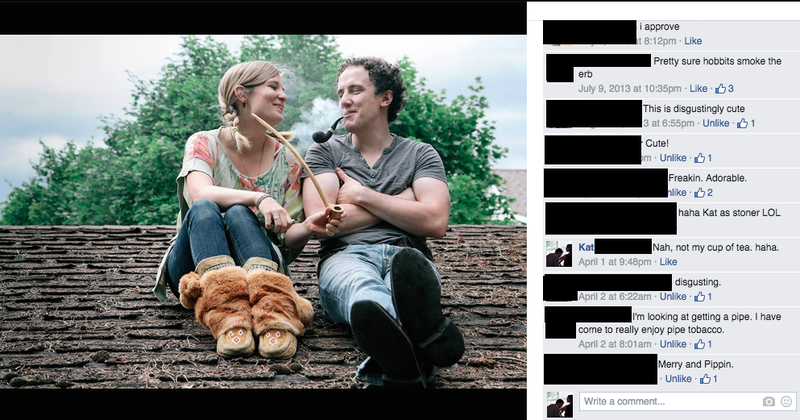 In contrast, when I posted a photo of my husband and I smoking a few years back, I received the exact opposite reaction. People loved it. We were told how cute we were and there were, of course, a few marijuana jokes peppered in there as well. I’m still not really sure if that one comment meant it was disgusting that we were smoking, or if it was a variation of the “disgustingly cute” comment someone else made. Maybe the reason we didn’t get chastising comments on this photo was because the people who know us know that we smoke so rarely that we couldn’t possibly qualify as real smokers. Then again, maybe it’s because cigars and pipes are still riding a trend-wave after their hipster comeback a few years ago. 3) We actually encourage unhealthy behaviour, as long as you aren’t already fat. I touched on this issue in one of my first posts for CWR, about Jennifer Lawrence and diets. I wrote about how much I loved Lawrence as a refreshing “everygirl” who ate fries and pizza and didn’t care about her weight. At the same time I struggled with celebrating these unhealthy habits when I was trying to make good choices in my own diet. While Lawrence’s “obsession” with food was tolerated because she was young and cute and thin, she has since cut back on these public displays and even appears to have lost the weight directors were telling her to. To have a women like Lawrence, as fun and entertaining as she is, represent real, laid-back chicks isn’t an honest representation of what kind of work goes into sustaining a Hollywood body. Heck, a lot of work goes into sustaining bodies that don’t even fit into the Hollywood standard. The majority of the time, beauty is not effortless, especially the kind of beauty we see in movies. It can be really discouraging to realize that you can’t actually sit around eating pizza all day and still look like Jennifer Lawrence. Unfortunately, a lot of women (and probably men too), feel like they need to maintain this illusion. For her, it was incredibly discouraging to realize that people in her life would rather that she appeared to be healthy (even though she struggled with anorexia) than be a little bit overweight and actually live out better habits. Setting aside the prevalent problem of eating disorders, there is still the issue of general self-hate. I’ve seen my own loved ones struggle with this spiral of shame and self-hatred, ultimately to have it lead nowhere. When it comes to losing weight, shame is a terrible motivator. More often than not, it just leads to depression, apathy, and often, overeating. I’d like to think I’m happy with my body. Even as a teenager I (surprisingly) didn’t think about my weight very much. Back then I had a pretty decent metabolism, so even if I wasn’t the skinniest girl in my class I never felt uncomfortable with my weight. Even now, there are times when I look in the mirror and I think to myself “damn girl, you looking goooood”. Yet somehow, self-hate has snuck up on me these last couple years. The other day I looked down at my stomach, grabbed a flabby roll and imagined what it would be like to make an incision at the bottom and scoop out a little bit of the gelatinous mess inside. Flatten things out a little. This was one of the first photos to pop up when I googled “body hate”. The hatred I felt for my body surprised me. It was so unexpected. Honestly, I’m not sure where these thoughts came from, or why now, all I know is that I’m not the only person who has felt this way. 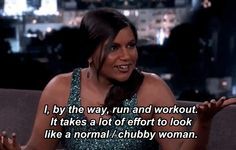 That is why I need fat acceptance. 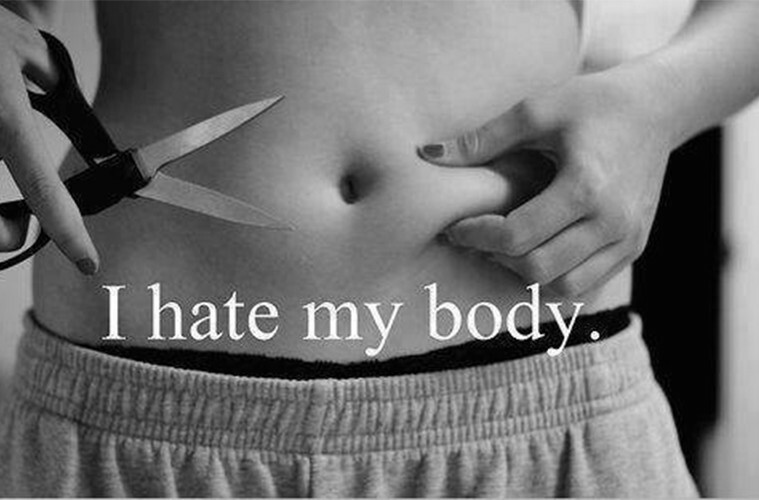 I need it because I don’t want to hate my body, regardless of the shape it takes. I also don’t want shame to be my motivation. Instead, I want to make healthy choices because it makes me feel happy, and strong, and ready to walk up steep hills (those hills man, gotta watch out for them). So, if body size doesn’t necessarily dictate health, and shame has never been a great motivator anyway, then why are we so afraid of fat acceptance? Are we just worried fat people might think that they too are *gasp* real people deserving of love? This entry was posted in health and tagged Amanda Bingson, America, anorexia, Body Issue, body positivity, body size, bulimia, cute, eating disorders, effortless beauty, ESPN, fat, fat acceptance, happy, health, healthy, Hipster, illusion, Jennifer Lawrence, Jessamyn Stanley, love my body, make-up, Meghan Tonjes, mental-health, metabolism, Mindy Kaling, motivation, obesity, overeating, physical, pinterest, pizza, quirky, real, self-hate, shame, Size, slim, smoking, strong, thin, trendy, Tumblr, unhealthy, weight loss, yoga, yogi. Bookmark the permalink. This is great. I’ve talked about it elsewhere but I think it bears repeating that we often conflate health with vanity and it leads to an awful confusion. A while ago my husband commented to his parents that he was going to focus on reaching some health goals, like running a set distance or eating better meals instead of focussing on losing weight and from the way his dad reacted you’d have thought he said “screw health I’m going to eat candy for breakfast every day!” it was like he could not understand that weight loss was not the most important factor… Why would anyone “be healthy” if the point wasn’t to look good at the end? It’s especially weird because James’ brother was horribly sick for years with gastrointestinal problems. He was always a skinny dude but there was a point where he was absolutely skeletal… I’m talking about a 6’5″ guy who weighs 160 lb because he has malabsorption issues. He was finally diagnosed as celiac and is starting to do better. But all you had to do was look at him to know that despite being thin, he was absolutely not healthy. I always love your comments Emily. You always have a great example. Haha thanks. James says I often get caught up in the examples and forget to make my point …so I’m glad it’s working for someone!